That’s right baby! I’ve teamed up with Oppo Ice Cream once more to bring you a naughty little winter treat! 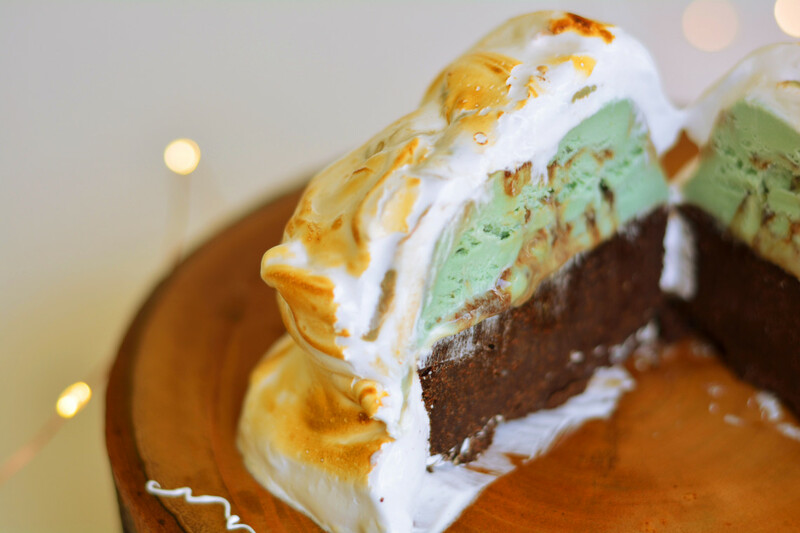 Last time I brought you the spectacular Raspberry Raw Brownie Ice Cream Sandwich but this time around I’m bringing you the rather retro (but spectacular) Grasshopper Baked Alaska! I have always had a little bit of an obsession with American desserts – S’mores Brownies, Grasshopper Pie, and of course the Baked Alaska. There’s something just so glamorous yet gaudy about them all, so much so, that I can’t help but be fascinated. Naturally, rather than making them all separately I decided to merge them all into one big dessert. 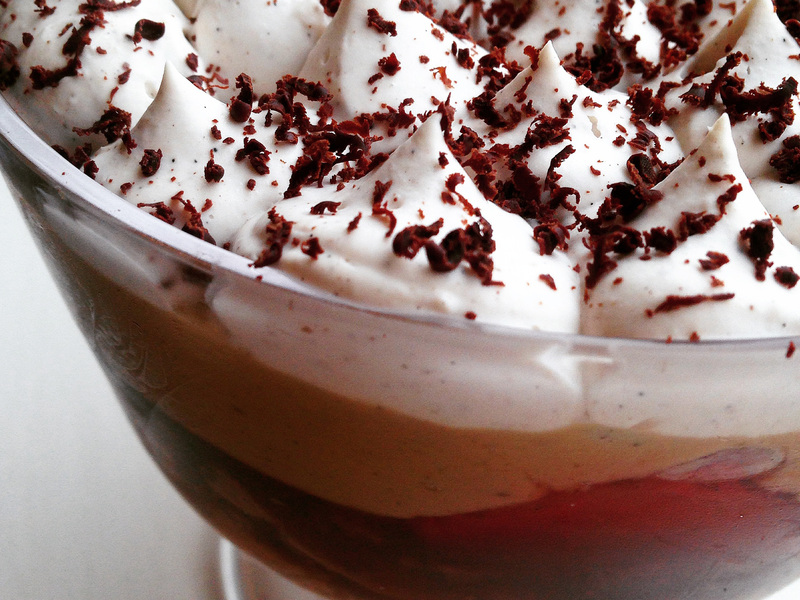 Looking for the perfect winter dessert? 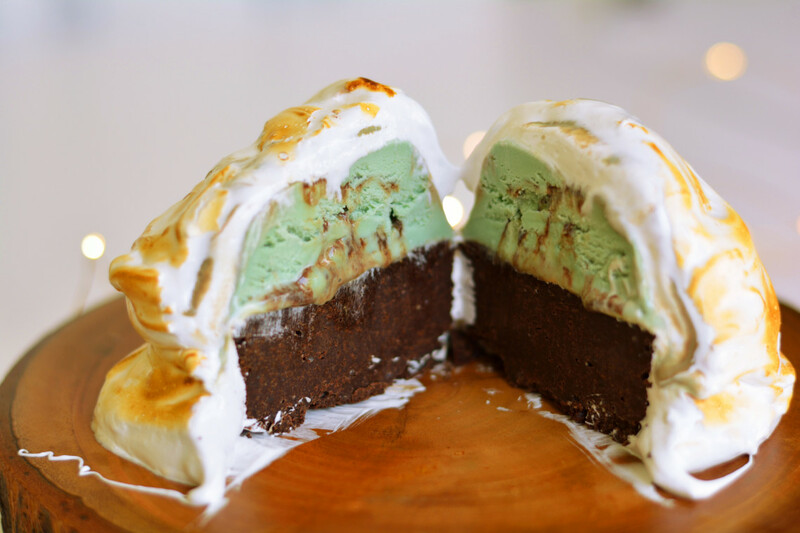 This Grasshopper Baked Alaska features fudgy brownie, topped with mint chocolate ice cream, all slathered in ooey gooey aquafaba meringue! 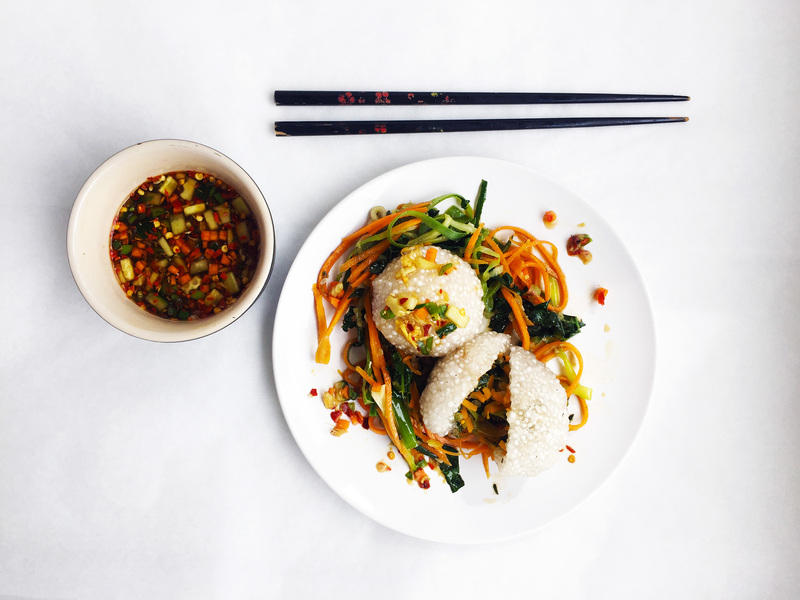 Now, before I witter on about how fab my recipe is (because it really is) I’d just like to thank those of you that voted for me in the very first UK Paleo Awards – it actually paid off! Although I didn’t win first place I did, in fact, win Runner-up as UK’s Paleo Blogger of the Year so it’s a pretty darn amazing feat! 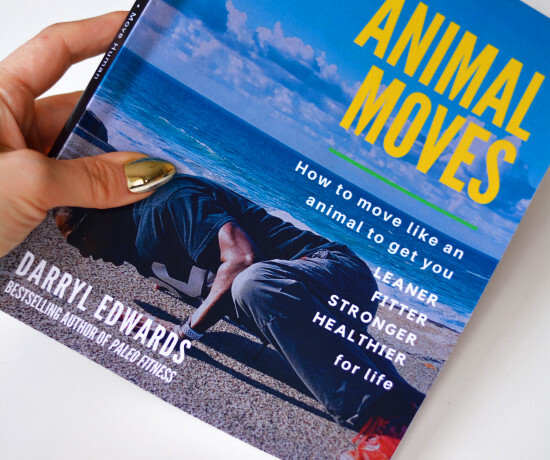 Sometimes with this blogging ish I just feel like I’m slowly going nowhere. What a lot of people don’t realise is that this can consume your entire life and it not only turns into an obsession but also a full-time job with a very low wage. In fact, at certain times of the year I’m even at a loss and so it’s so easy to get caught up in the negative thoughts that whirl around my brain. I’ve had several times this year where I have very nearly felt like throwing in the towel because I didn’t feel like I was getting as far as other bloggers, or as far as I wanted to be, because my life wasn’t allowing me to, or that I wasn’t really giving you all that you wanted. So, it’s times like this when I realise there are a lot of you out there that really do appreciate what I’m trying to bring to both the Paleo and healthy eating scene within the UK, and across the globe. From the bottom of my heart – thank you – your votes and your messages all mean the world to me. Enough of my blubbering… For those of you that don’t know, Grasshopper Pie is a superbly gluttonous dessert, constructed of an Oreo cookie base, a mint marshmallow filling (usually hiding copious amounts of Creme de Menthe, but not always), topped with fluffy whipped cream. The infamous Baked Alaska however, is a dome-shaped dessert consisting of a spongecake base, topped with gallons of ice cream, and covered in lashings of uncooked meringue. The dessert is then lightly baked before serving. I decided not to bake mine the traditional way due to the coconut oil used in Oppo I found that it melted too easily. I, therefore, used a chef’s blowtorch which I picked up on Amazon for about £10. 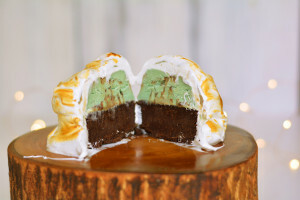 For my Grasshopper Baked Alaska I decided to create a dark, fudgy brownie base, with Oppo’s delicious Mint Choc Swirl ice cream for the filling, and a vegan meringue/marshmallow fluff topping. 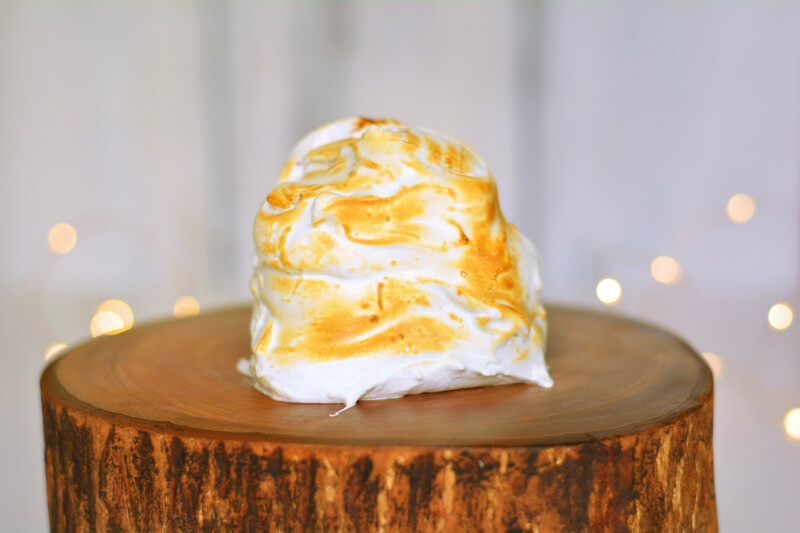 Although this dessert isn’t vegan I’ve used my recipe for vegan aquafaba meringue simply because it’s fast and failproof. You won’t have to fret about overbeating your eggs because aquafaba does not hold the same qualities and it also holds its structure pretty well – provided you whip it for long enough and use the correct amount of aquafaba. Don’t worry – you absolutely cannot taste the difference at all, and in my opinion, the taste and the texture are identical to that of egg white based meringue. As you can see my brownie to ice cream ratio was about the same so I think next time I’d cut my brownie in half to make it 100% perfect but either way it was pretty darn tasty. So? What’s so special about Oppo ice cream anyway? Well, it is made with fresh milk from grass-fed cows, cold-pressed virgin coconut oil, stevia leaf, and an added superfood boost (depending on the flavour). With only 40 calories per scoop and 60% less sugar and calories than the regular sugar-laden stuff, it’s a sure-fire winner and it also makes room for adding in some extra naughties just like I have! Oppo is currently available in the following flavours; Salted Caramel with a Hint of Lucuma, Madagascan Vanilla with a Hint of Baobab, Colombian Chocolate and Hazelnut, or Mint Choc Swirl with a Hint of Spirulina. You can pick up a tub from Ocado, Waitrose, Co-Op, Whole Foods Market, Budgens, Holland & Barrett, and many more. To find out your nearest stockist just click here. Preheat the oven to 170°C/gas mark 3/325°F. Grease and line a brownie tin (20cm/8"x20cm/8"x6cm/1.5") with greaseproof non-sick paper and set to one side. Melt the chocolate and butter gently over a bain-marie. Remove from the heat and leave to cool until hand hot (lukewarm). Beat the eggs and coconut sugar together using an electric hand whisk or stand mixer until pale and smooth. You should be able to trace ribbons of the mix from your whisk for at least a couple of seconds. Fold in your egg mixture into your melted chocolate. Sieve in your ground almonds and cacao powder and fold again. Be careful not to knock any air out of the mixture. Plunge the spatula in at one side and work in a figure of 8 until you have a beautifully glossy mixture. Transfer the mixture into your lined brownie tin and bake in the oven for 25-40 minutes. The top should be set but the mixture gooey on the inside and the outer edges should come away from the sides. Leave to cool completely before placing a mini pudding basin on top and cutting out 3 round brownies, cutting around the outer edges of the basin. Start preparing your moulded ice cream by greasing 3 mini pudding basins and line with cling film. Be sure to leave a handful of excess to help you lift out your ice cream later. Divide your Oppo ice cream equally between the 3 basins and smooth out the surface as evenly as possible. Fold over the cling film on top and return to the freezer. It's now time to whip up your meringue topping. Divide your raw cane sugar into 2 equal halves, Transfer one half into a high powered blender and using a milling blade, process until it begins to turn into an icing sugar like consistency. Place your powdered sugar and the remaining ingredients for the meringue into a stand mixer, alternatively use a large mixing bowl and handheld electric or manual whisk. Whisk until smooth and fluffy with stiff peaks. You shouldn't be able to feel any grittiness of the sugar when rubbing the mixture between your fingers. Place your brownie rounds on a baking tray and evenly space them giving you plenty of room to work. Remove your pudding basins from the freezer and quickly dip them in some freshly boiled water before gently tugging and the excess clingfilm to remove. Place the ice cream on top of the brownies. Return to the freezer for a further 10 minutes to firm up. Take a couple of tablespoons of the meringue mix at a time and swirl on top of the Baked Alaskas. Give a quick blast with a chef's blowtorch, or if you don't have one simply pop under the grill until golden. Serve immediately. 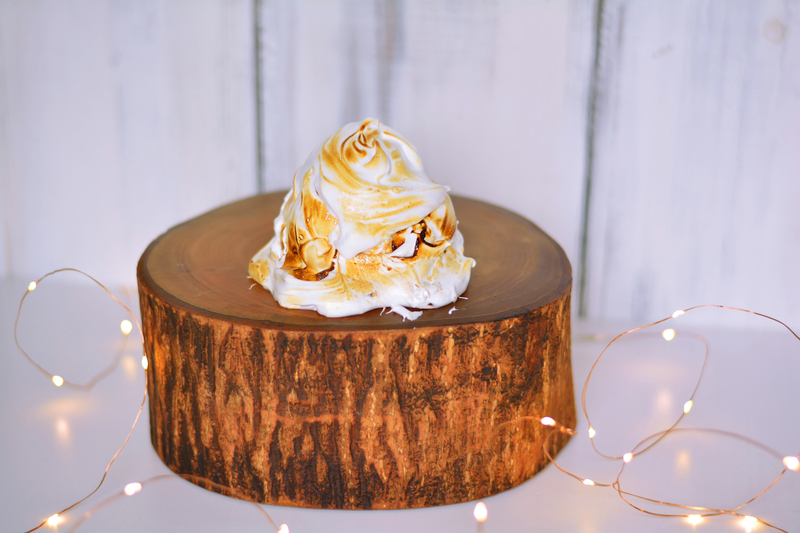 The recipe makes 3 mini Baked Alaskas - I found 1 too filling for myself so feel free to freeze and thaw out at a later date before browning your meringue topping.